Can you teach yourself to play the guitar? Of course, you can. There are plenty of tools at anyone’s disposal to help aid in the guitar learning process. Is the guitar easy to learn? Depending on your willingness to dedicate a bit time to the craft, it absolutely can be. 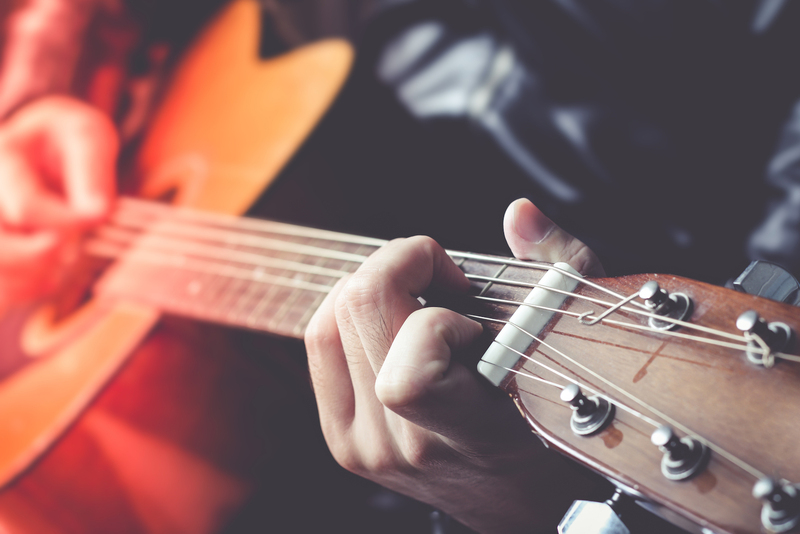 Learning how to play the guitar can seem like a daunting task in the beginning. Why? Because learning an instrument is similar to learning a foreign language. You cannot expect to become fluent right away. By following informative steps and allowing time for plenty of practice, you can teach yourself the guitar. How do you learn the guitar by yourself? 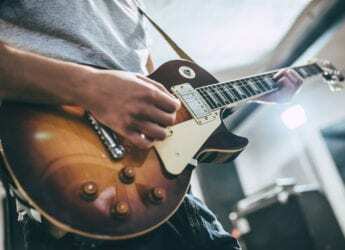 The most important step to start playing the guitar is learning how the guitar works, as well as the different parts that exist on the instrument. You cannot just pick up the guitar and play without knowing exactly what you are handling. Understanding the basic structure of the guitar is critical. 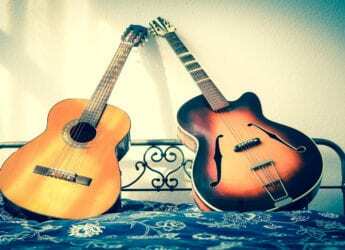 Learning the guitar, for beginners, should always start with getting familiar with the strings and fretboard. To teach yourself guitar chords you’ll need to grasp how the strings and fret system work together. Do not just dive right into playing chords without knowing what you are playing and how exactly the guitar works. This will lead to a hollow understanding of the instrument, further complicating the learning process in the long run. 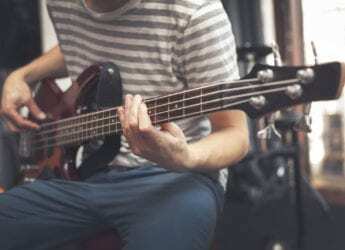 A good way to further your understanding of the basics of the guitar is to use literature precisely written for people self-teaching guitar playing. “Guitar Basics: A Beginning Guitar Method Book 1,” by Michael Christiansen is an excellent book for people teaching themselves the guitar. It begins by explaining the fundamentals of the instrument. Books such as this are extremely helpful, not only because of the necessary information they provide but because a beginner can read and learn the information at their own pace. If you are using a book to teach yourself guitar, do not rush. Slowly read through the fundamentals and apply what you have learned in the readings to your own guitar. This will be extremely helpful as you move on to learning chords. Guitar notes and chords go hand in hand. Notes are individual sounds played on a single fret of a string. Chords are a set of notes played simultaneously to create a fuller sound. Notes exist on every fret of every string of the guitar. For example, if you pluck a string, you will hear the note it produces. If you then place your finger on a fret of that string, the guitar will produce a different note. Notes are singular and fairly complex to memorize across the entirety of the fretboard. Don’t worry, however, as there are products that can help you memorize notes as you teach yourself the guitar. Fret Daddy is a set of stickers that can be placed on the fretboard of the guitar. On each sticker is a note that corresponds to a string and its frets. This is a visual representation of notes all across the fretboard. As you place a finger on a fret, you will know exactly which note the guitar will produce when strummed. As you become more familiar with the notes, memorizing them in the process— you can remove the stickers and move on to guitar chords. Chords are a set of notes played simultaneously. Each guitar chord consists of at least two guitar notes. 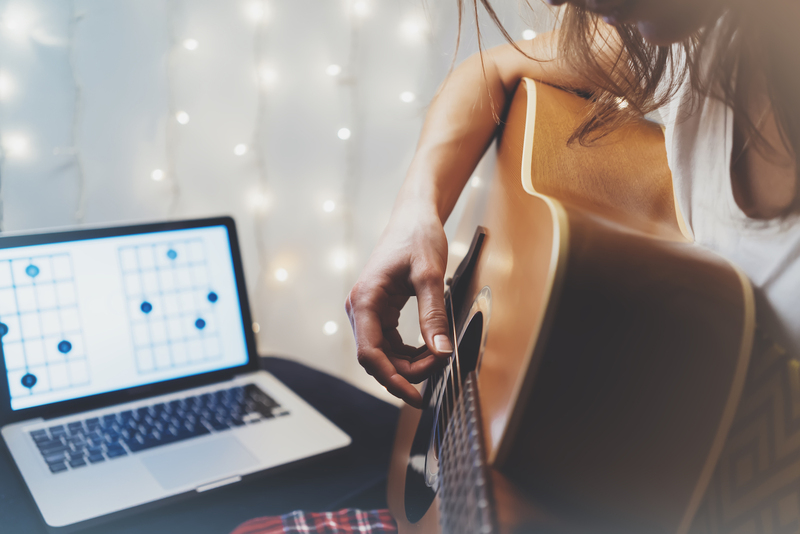 Though chords are technically more complex than notes, they can be learned much faster than individual notes if you teach yourself notes and memorize them beforehand. Jake Johnson’s “Guitar Chords: Easy-to-Use, Easy-to-Carry, One Chord on Every Page,” is an excellent book to help teach yourself guitar chords. This book consists of 360 chords. As the title explains, each page consists of one chord. Each page explains what notes are used in a chord and where your fingers should be placed to play the chord correctly. Keep practicing a chord until you can play it without messing up your finger placement. After some time, you will be able to memorize and play the chord without the air of the book. Once you have familiarized yourself with a chord, move on to the next one. After learning multiple chords, try transitioning between the chords you have taught yourself. This may take some time. However, it is extremely necessary to learn how to transition, as this how a guitarist plays a song. Once you have an understanding of guitar notes and chords, you are ready to move on to learning songs. Some people are able to play a song by ear. They can distinguish which notes and chords are played in a song by familiarizing themselves with their distinct sound. For most people, however, they need help teaching themselves how to play a song. Perhaps the best way to learn a song is with the help of the app Ultimate Guitar. Ultimate Guitar is an online source that provides the notes and chords for thousands of songs. 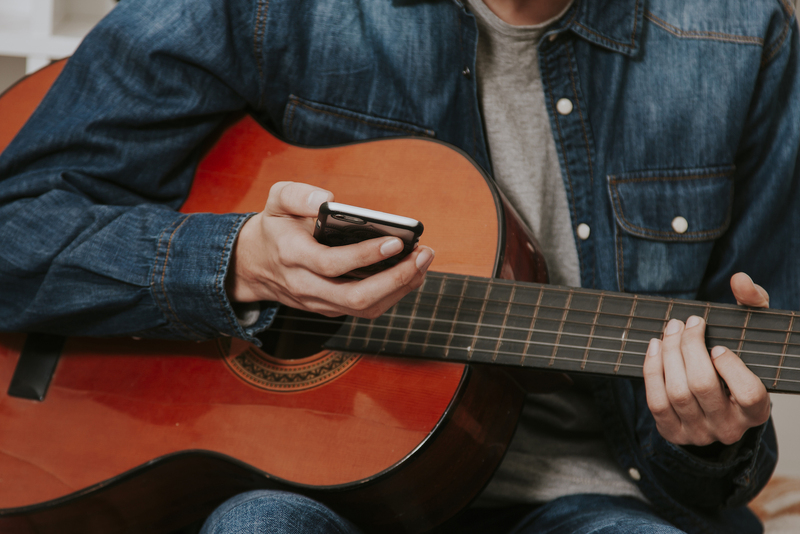 Ultimate Guitar is available in app form, providing tools to help a person learn notes, tabs, chords, and tuning—enabling a beginner to learn full songs on their own. UG shows a person teaching themselves how to play the guitar the correct chords of a song and when to play them. In the app, a chord is represented by their given letter and is located above a word in the given lyrics. This is where transitioning between chords becomes extremely important, as many songs have fairly quick chord transitions. As long as you follow our provided steps in order, you will be able to teach yourself guitar. Do not rush through the process because each step is necessary to improve your playing skills. Practice as much as you can. The more you practice and study certain aspects of the guitar the more proficient you will become in the future. 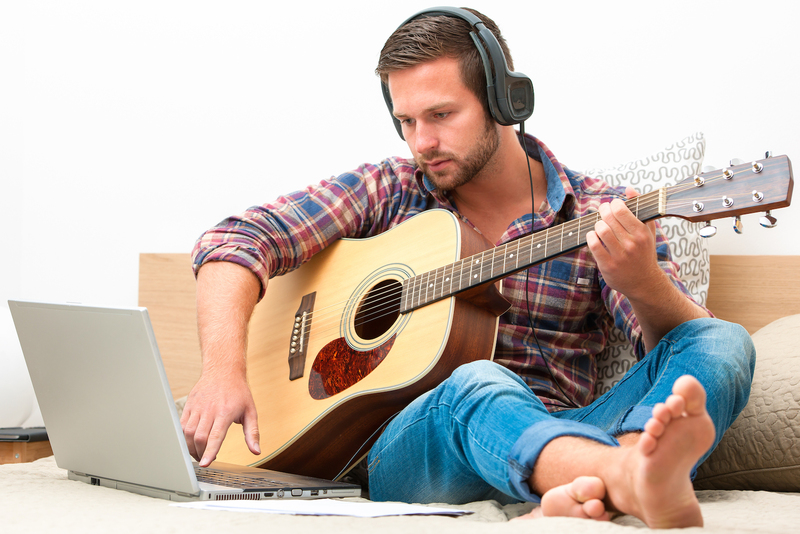 Not only will you be able to teach yourself guitar notes and chords, but full songs as well. There is a great sense of accomplishment when you teach yourself how to play the guitar. If you teach yourself the correct way, you’ll be playing the guitar like a pro in no time. Are you ready to teach yourself guitar playing? Share with us below with any questions, tips, or tricks you’ve learned while learning to play guitar.